Statistics released by the Department for Business, Energy and Industrial Strategy (BEIS) reveal an increase in household energy bills in 2018. The figures show that the average household energy bill (based on an annual fixed consumption of 3,800 kWh for electricity and 15,000 kWh for gas), increased by £65. This represents a 5.2% increase from 2017, bringing bills up to £1,314). On average, electricity bills increased by £49 and gas £16. 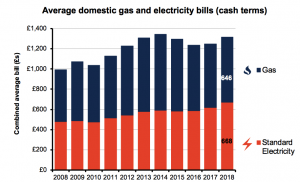 When based on actual annual consumption, households have seen a increase of 3.9% in cash terms (to £1,155) and a 1.9% real term increase (£1,010 in 2018) in their combined energy bills. The figures highlight the pressing need for Government to take urgent action to tackle fuel poverty, which affects 2.55 million households in England alone.